Gracious taco vendors eagerly await the interested public. One in particular took my palate on a magical journey, Border Grill. On the cusp of me trying a vegan burger, about a week prior, Border Grill served me a vegetarian taco that sent my tastebuds into a mystical wonderland. As omnivrious as I am, it is a truly moving experience when there is an all vegetable dish that I like, respect, and would try again. 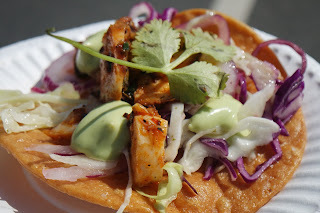 As I carried on moving from stand to stand I tried many vendors, like: Corazón De Tierra, Las Montendaras, Bull Taco, Don Chente, All Flavor No Grease, and several more; but few stood out more than the Tacos de Pork Belly from Amor y Taco Mexican Kitchen and Cantina. 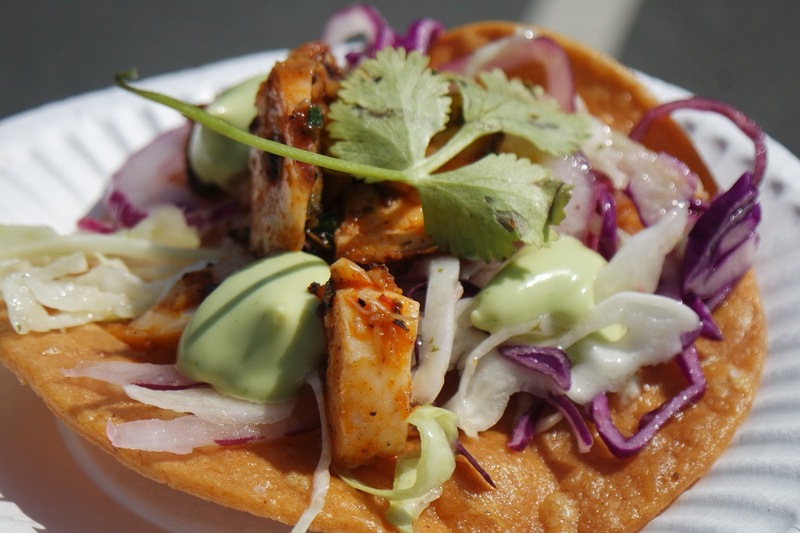 Their taco featured slow-braised pork belly, watermelon and jicama salad, and pumpkin seed mole verde on a fresh flour tortilla. The flavors combine in a tasteful yet light treat. The delicious pork belly captures your senses in every way, the strong bacon taste with the right ratio of meat and fat engages you, the smell is as pleasant as baking bread is on a Sunday morning, the echoing sound of chewing fills your ear canal, and your heart is content. In that instant, you are in a place of blissfulness, and nothing could go wrong in the world. There is an abundance of Mexican food prepared by Mexican people in South Central Los Angeles; but it would be an African-American prepared quesadilla which astonished me. Chicken Quesadilla from All Flavor No Grease. All Flavor No Grease is located on 108th Street and Central Ave, and I was introduced to them at Tacolandia, oddly enough, having lived in that area for many years. The quesadilla is packed with hearty bites of chicken breast, layered with melted, oozing cheese, and filled with guacamole and chunky tomato bites. It was amazing. After trying it I went back to their booth and fist bumped the chef. It was that fascinating, and well-executed. It was a scorching pre-summer's day in Los Angeles, though relief would come from a refreshing shaved-iced drink topped with an available selection fruits, and juice. Mango-strawberry was my choice, and it was exceptional. Not overly sweet but soothing, plentiful, and gracious; kind enough to make the day beautiful. My legs are aching, my belly is filled, and I am ready to sit, sip my drink, and bask in the happy faces around me.